The story of the Berliner Solarpraxis Neue Energiewelt AG began in 1992. The two later-founders Karl-Heinz Remmers and Kay Neubert, amidst their ongoing studies, got the ball rolling by planning and installing solar panels in a garage. 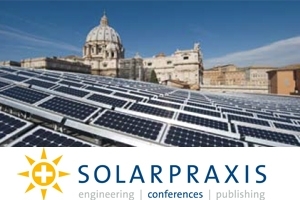 In 1998 Karl-Heinz Remmers, Kay Neubert and later entrant Holger Bedurke, founded Solarpraxis as a private corporation. Since 2000, the company is a public limited company. The fundamental pillars of the company was and is, to offer a bridge between technological development and how such development is communicated, defining products for the new energy world and with relation to that, excellent service. As one of the leading brands for knowledge-based services in the new energy world, the Solarpraxis Neue Energiewelt AG with its subsidiary Sunbeam GmbH as well as Solarpraxis Engineering GmbH, which was established by Solarpraxis, employ around 40 people. The core of Solarpraxis Neue Energiewelt AG revolves around the well-known industry get-togethers. And an integral part of that is the Forum Solarpraxis, Europe’s biggest business oriented solar conference which has been taking place since 1999. The subsidiary Sunbeam focuses on the development of complex Typo3 websites and professional communication. There is also a strong partnership with the pv magazine group, which was also founded by Solarpraxis.